There's a lot of pressure on first ladies to dress fashionably. And America's new first lady, Melania Trump, can pull from her background as a fashion model. But how did the Slovenian-born model get her start? Trump was first discovered by Slovenian photographer Stane Jerko while sitting on a fence waiting for her friend to finish walking in a fashion show. "It was January 1987 when I went home just before the end of the fashion show," Jerko told TODAY via email. "On the stairs of the Festival Hall, I saw a girl that immediately caught my eye. There stood a tall, slender and attractive long-haired girl with distinct eyes." 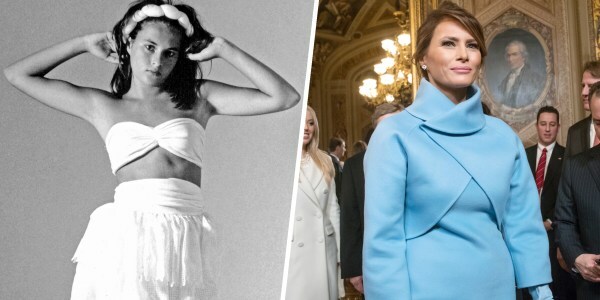 Look back at Melania Trump's best style and fashion moments, from her early modeling days in Slovenia to her inauguration day outfit. That girl was Melania Knauss. The photographer invited her to his studio for a trial shoot. For their first photo session, Knauss brought her own wardrobe and Jerko said that her first photos were "very promising." She returned for a second photo shoot, this time to model clothes from a Slovenian textile factory. The photos he took at those sessions made up her first portfolio and began her career as a professional model. Jerko described Knauss as shy and reserved in the beginning but said that she quickly became comfortable in front of the camera. He also said that she was very eager to learn about the lighting, hair and makeup that went into each shoot. Knauss continued to model, working in Milan and Paris before moving to New York in 1996 where she met and married Donald Trump. And the rest is history!